Before I started organizing the Burger Hunt in Oslo, I asked people living in Oslo via Facebook which location served the best burgers. Needless to say, it was a really popular topic (over 170 responses!) and people felt incredibly passionate about their favorite burger spot. The most popular location was Illegal Burger. Illegal Burger is a quasi-fast food joint in Oslo near Youngstorget. Perhaps, one could consider it a fast-casual restaurant. I suppose that means it is nicer than a McDonalds but not a true sit down restaurant. This is a pretty accurate description of Illegal Burger. Very casual and orders are filled in about 10-15 minutes. After speaking with several people, Illegal Burger is an extremely divisive place. Basically, either people love it or hate it… and have strong feelings either way. I imagine it’s much like people’s opinions on food like goat cheese or white chocolate. 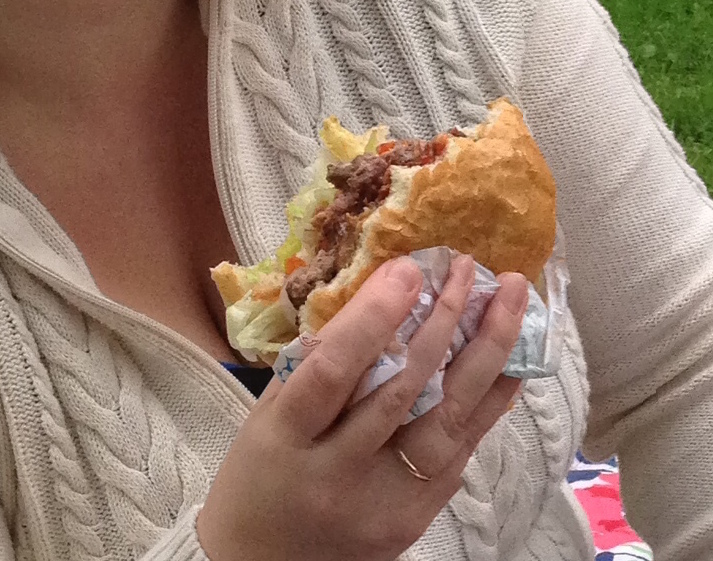 Now back to the eating… Several of us girls decided to take our burgers and picnic outside. It was a good decision as Illegal Burger has very limited space and due to the grill inside the restaurant, it gets extremely smokey. Also, we wanted to take advantage of the nice weather in Oslo. I decided to order the Blue Cheese Bacon burger. This is my very favorite topping combination for a burger. Generally speaking, if I see a burger with this combo, I’m going to order it. The burger was cooked automatically to well done. The burger itself had a thin patty with a really smokey taste. I’d say it is similar to the taste that meat can have when liquid smoke is added to it. This taste definitely distinguishes it from the other burgers thus far. You could taste the shredded lettuce and tomato with the burger but the cheese and bacon were a bit lacking. The toppings were certainly there but not significant enough, in my opinion. I believe that you need to be able to get a good taste of all the toppings with each bite. All in all, this place is a bit overhyped in my opinion. I’d say Illegal Burger serves a decent burger and as it is open late, a good spot for a quick late night bite. Next on the list? Another fast-casual place, Munchies. Next Happy Belated Anniversary! New Logo. New Look.